← How to convert wmf to j2k? Everyone has habits,whatever in our daily life or in our daily work.For example,some people log into the internet and like setting the “Google” as their homepage,but other people like log into the internet and like setting the “Fire fox”as their homepage.I think this kind of habit is reasonable for us,it’s no reason ,just it is suitable for us.So the same principal for the application about the software.Some office workers like hide the menu bar of the pdf files and let their reading space become large,but some of them doesn’t like it.However,the company verypdf.com Inc.developed a useful software the advanced PDF Tools,which can satisfy all office workers. 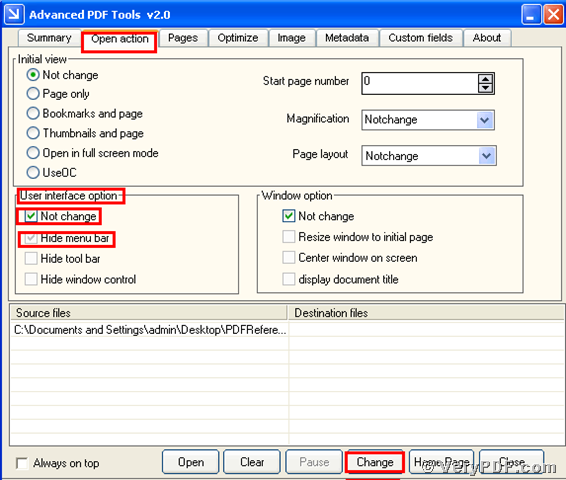 If you are used to hide the menu bar of your pdf files,my advice is that you can follow my topic about how to hide the menu bar of pdf files by using the Advanced PDF Tools. one steps,double click the icon of the Advanced PDF Tools,let this software is working.Then drag your PDF file into this program.You will enter into the application interface.You can see the horizontal label pages like(Summary/Open actions/Optimize/Custom fields/About),please click the label page”Open action” ,there will appear a form ,in your left hand ,behind the “user interface option”.You can see the check boxes like (Not change/hide menu bar/hide tool bar/hide window control),you need to cancel the check box“Not change” and check the “hide menu bar”.Then save the change.Please look at the picture 1. 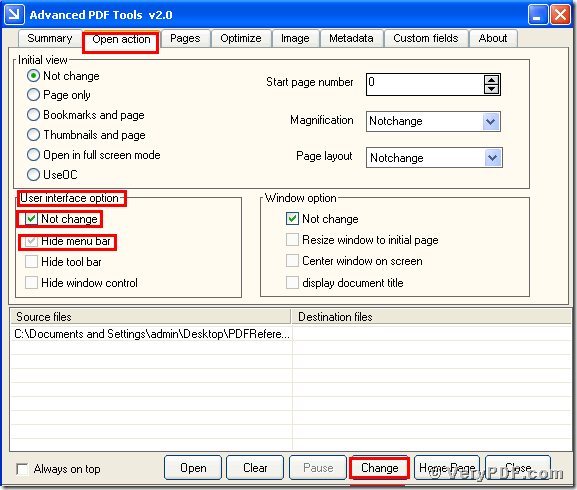 Second step,open your changed pdf file, you will find the change,we had hidden your pdf file menu bar.So if you are a person who are used to this habit ,remember go to this website http://www.verypdf.com/order_pdftools_gui.html and purchase it,the price is very favorable,this company verypdf.com.Inc. are expert in this problem ,they devoted themselves to developing all kinds of PDF converters ,even if you are not interested in my this topic,but i believe this company verypdf.com Inc. can satisfy your other habits,they had already came into many company offices and a huge office workers had used ,also got good feedbacks.